Two bloody terror-attacks in Baghdad today. US-created ISIS is assumed to be the perpetrator. No reports of concurrent violence elsewhere, so we're looking for a weak Bloodbath Formula in the event chart. 1. Pallas conjunct Pluto (both bridged and mitigated by Sun). 2. Venus widely square Neptune. 4. Moon co-ruler Uranus square Pluto. I blame Barack Obama, whose foreign policy seems to have been designed to maximize the growth of Islamic terror. And yes, I do one of these Bloodbath Formula analyses every time some maniac fueled by prescription psych meds (West) or hyped-up religion (East) murders three or more people. Note that Neptune is associated with both medication and religion and is a component of the astrological formula for mass-murder. 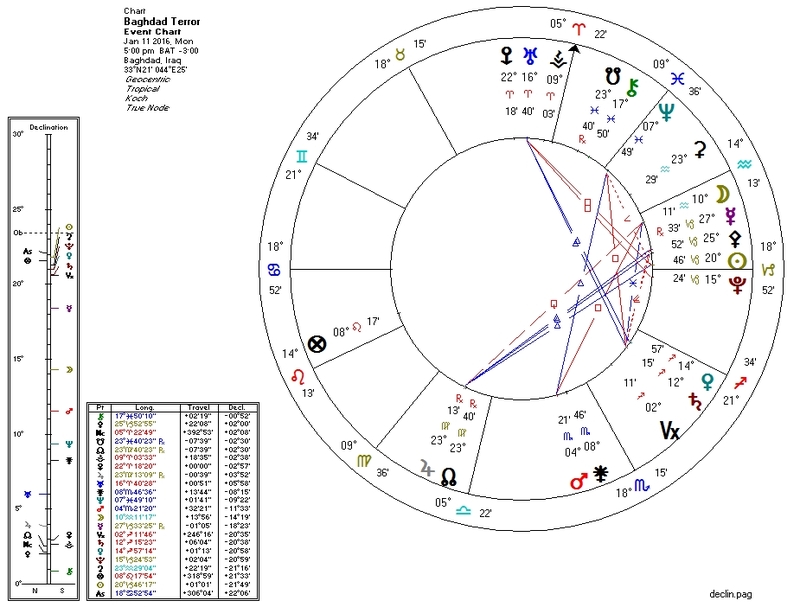 PS: This bombing in Yemen the day before has a very similar chart, albeit with Saturn, ruler of Moon in Capricorn, parallel Pluto.